In the modern Digital Age in which we live, the smartphone seems to follow a very uniform design pattern. The large, touchscreen display is a form factor very few stray from, and besides the odd physical keyboard from BlackBerry, very few vendors can be seen breaking the mold. 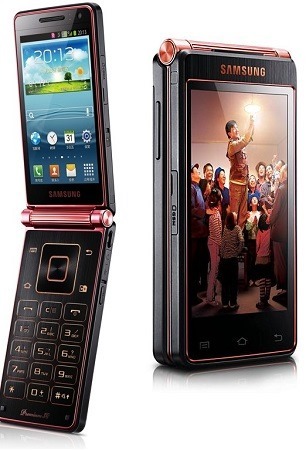 However, Samsung could be about to roll the years back once again with its second attempt at revitalizing the old folder phone design with a follow up to last year’s release of the flippy SCH-W2013. It’s questionable as to whether the tech world is in need of a flip phone of any description, and although the Korean company is certainly not afraid to explore all possible angles in its quest to please any and every prospective smartphone owner, another flip smartphone would seem a strange bet indeed. A testament to the lack of interest in those old folder types can be found in the fact that the SCH-W2013 will have passed many of you by without so much as a peep. The handset, which was released in late 2013 at a sky high price, failed to pique the interest of many, but with Samsung apparently going all affordable with the upcoming folder, perhaps consumers will be ditching their iPhones, Galaxy S4s and Lumias in their droves? The device, which is quite aptly named the Galaxy Folder (SHV-E400S/K), will likely pack a display with a WVGA resolution, but this is perhaps to be expected of a screen so small. Despite its look, the similarities with those old dumbphones end pretty much there, with a dual-core Snapdragon S4 chip keeping things ticking over and 4G LTE capabilities for those with a need for speed. Running on Android 4.2.2, the Galaxy Folder looks as though it’s caught in a time warp. Then again, there’ll doubtlessly be a few hopeless nostalgics out there looking for an efficient runner with an antique feel. Unfortunately, if you’re hoping to get your hands on it, the chances of seeing one – if you happen to reside in the Western World – would seem very unlikely. The SCH-W2013 was only released in China, and the Folder will, at least initially, debut in South Korea. Having seen the images and read through some of the specs, would you go consider the Folder?